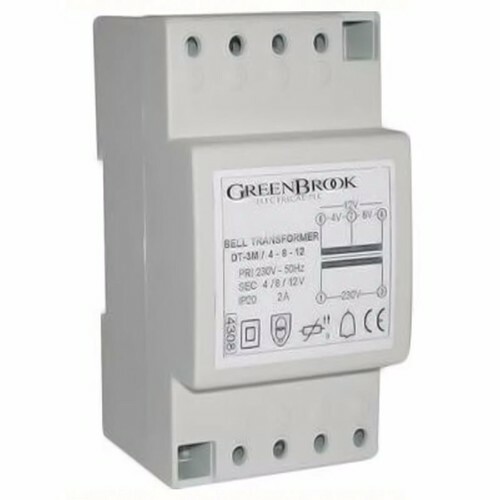 The Greenbrook DAT03A Bell Transformer is designed for use in conjunction with the Greenbrook hard wired door chimes when you want to convert an existing door push to an illuminated one. This transformer is a tripple DIN rail mounted module with fully segregated primary and secondary connections. This doorbell transformer supplies power for 4v, 8v or 12v door bells rated up to 2A. Comes with a 12 month manufactures warranty. Bought this to replace an old doorbell transformer. This one is better because it is more powerful and easily sounds two doorbells (upstairs/ downstairs) at the same time on the 8v terminals. Also runs one louder 12v bell on the 12v terminals. The old transformer was rated 8v 1A and could barely cope with two 8v doorbells at the same time. Unit is small, was easy to fit and seems well made. Very satisfied. excellent product i would recommend this seller to anyone.